Update 6: Just added another autograph signing for Monday, September 1st! Update 5: PAX Prime exclusive t-shirt design revealed! 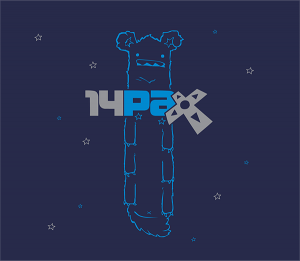 Update 4: Since Game 4 was announced, we’ve updated our PAX schedule with our live streams! We’ll be guests on a few live shows at PAX. Update 3: Our Director of Usability & Test will be at the Community Impact panel! Update 2: More info on PAX pins has just been added! Update: Signing times have changed to Friday & Saturday from 1:30pm – 2:30pm. Our final expo for the year will be Penny Arcade Expo in Seattle from August 29th thru September 1st! We will be bringing some new merchandise and holding a few events at our booth (#3003). We’ll keep this post updated with any new items we add, so be sure to bookmark this page! With our recent Game 4 announcement, we figured it’s an appropriate time to reveal our exclusive t-shirt design for this year’s PAX Prime! This tee features our space bear and it will be available in American Apparel unisex sizes (XS thru 2XL). Limited quantities available for each size. Get it early otherwise you’ll be as blue as the shirt when they sell out! 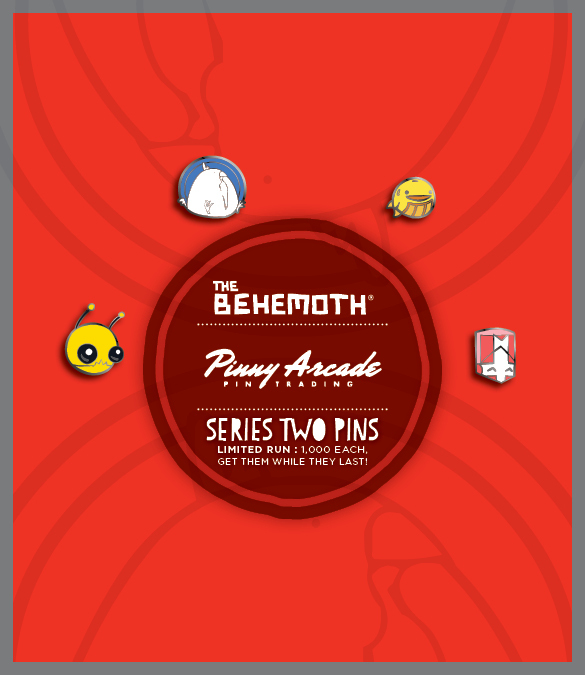 As we’ve done in the past, we’ve partnered up with Penny Arcade (Pinny Arcade) to do some awesome pins that are only available at Penny Arcade Expos. 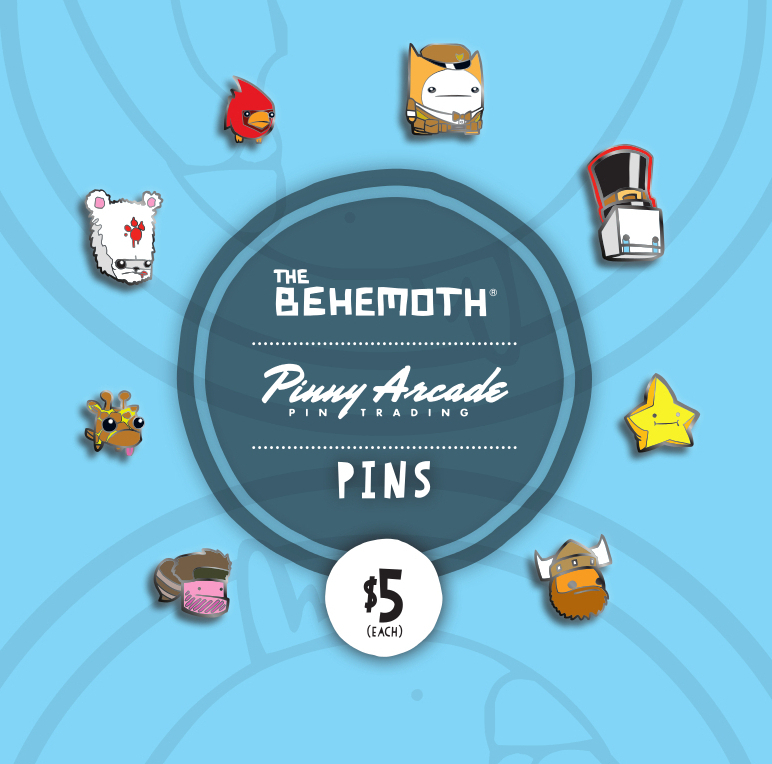 This PAX Prime, we’ve brought two new pins that will be available to purchase at our booth. We will also be bringing back Series 1 and Series 2 pins! You can find all of the pins in our Chonku Chonku machines at the booth. Series 1 and Series 2 will continue to be blind boxed, but these two new pins in Series 3 will not be randomized. 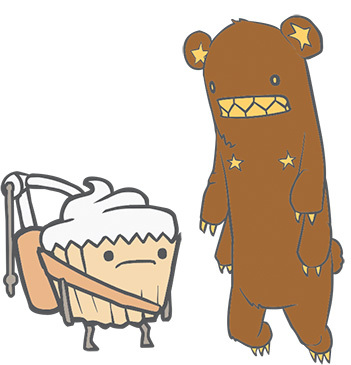 Series 3 pins will be in a Chonku Chonku machine purely for cupcakes or purely for spacebears. 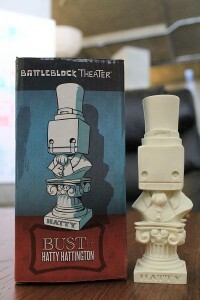 New to PAX Prime and currently an expo/con only exclusive, we’re bringing you a super statue of BattleBlock Theater’s Hatty Hattington. Doesn’t he look divine? Our Director of Usability & Test, Lindsay Miller, will sit on the panel and give her take on community involvement thru UX. This schedule is tentative and may possibly change at anytime. Check back on our blog for updates.